Green Island Outfitters is located in the Peace River Valley of Fairview Alberta, Canada. The Peace and Smoky River Valleys and their tributaries as well as the surrounding boreal forest and agricultural country provide tremendous habitat for bear hunting as well as moose hunting, elk hunting, mule deer hunting, whitetail deer hunting and waterfowl hunting! All of our black bear hunts, whitetail deer hunts, mule deer hunts, moose hunts, elk hunts and waterfowl hunts are conducted from our 4,700 square foot log lodge. There is no question the Peace River country has gained a lot of popularity with hunters in the recent years and has become a destination of choice for big game and waterfowl hunting. We are a family run business Al personally guides many of the hunts along with his daughter Lacey and other local guides. Lacey and Travis are black bear guides. In the fall they also help with the waterfowl hunts, setting up decoys and Lacey is in charge of cleaning ducks and geese for the hunters. Al's wife Brenda and daughter Kristy help run the lodge. They prepare all the home-cooked meals and do everything to make sure your stay is comfortable. Give Al a call today to reserve your whitetail deer hunt, black bear hunt, mule deer hunt, moose hunt, elk hunt and waterfowl hunt with Green Island Outfitters. You will enjoy the hunt of a lifetime! 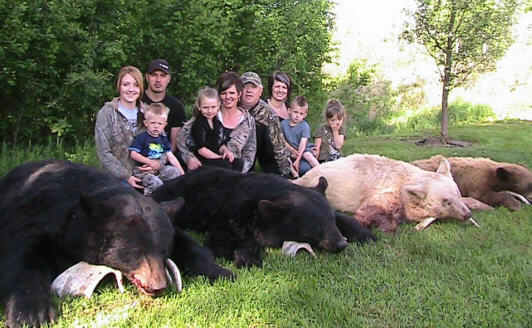 Hunt the boreal forest of Alberta Canada with a 2 bear limit and many color phased bears. We know how to put you on trophy class bears! Book your whitetail deer hunt today to get your sites on Alberta's world class trophy whitetail bucks with heavy bodies and horns to match! Our hunting area has produced some tremendous trophy deer averaging 170+. Book your Alberta mule deer rut hunt today! Harvest a beautiful Alberta elk with a minimum 3 points and average harvest size of 300 lbs on our rifle elk hunts during the rut. With an average 90% harvest rate you will have a great chance at bringing home a trophy Canada moose. Join us on this exciting moose hunting adventure! The Peace River Valley is one of the best waterfowl hunting areas in North America. Limit out each day on our goose & duck hunts!